Lynn Todman, PhD, first saw a connection between food and urban violence while conducting focus groups among young black men in Chicago’s toughest neighborhoods. Participants told her, “Ya gotta eat,” to explain why they dealt in drugs and burglarized places in their community. But when one older gentleman said, “This food is making us crazy,” Todman began to take her work in a different direction. An urban planner by training, she wondered if nutritional deficiencies associated with living in “food deserts” played a role in community violence. She began to read studies conducted by nutritional neuroscientists examining the link between nutritional deficiencies and anti-social behavior. The science suggests that diets that are deficient in key nutrients are associated with aggression, violence and other forms of anti-social behaviors. The literature led her to overlay two Chicago maps: one of the city’s food deserts and the other of the city’s most violent communities. Lynn Todman pitching in to serve lunch to students. The overlay was striking. Those areas of the city with the least access to nutritional food were also the ones experiencing the most violence. “It was hard to ignore what the map overlays were suggesting – where there’s a lack of quality food, there is also a high level of gun violence,” said Dr. Todman. While recognizing that there are numerous confounding factors, she found the maps, combined with the emerging nutritional neuroscience, compelling enough to pursue this possible connection. Could the lack of quality food be a determinant of community violence? Todman began to organize an effort to answer the question in Benton Harbor, Michigan. Benton Harbor is populated by about 10,000 people. According to the 2010 census, more than 95 percent of the city’s residents are African American, and 48 percent live below the poverty line. As in many low-income communities, Benton Harbor residents lack easy access to nutritious food, often relying on convenience stores, gas stations and fast food outlets. Todman received approval from the Benton Harbor Area School board to use one of their schools to conduct an investigation of the link between nutrition and behavior. The Sorter School served children with serious behavioral health challenges. The project involved a collaboration involving more than 25 team members with a wide range of insights, skills, knowledge and other resources. 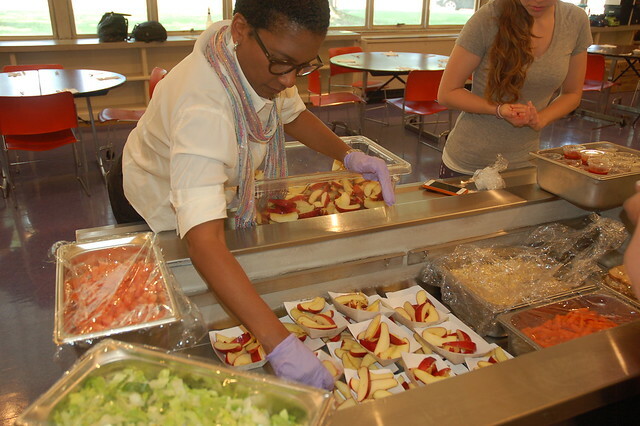 They included teachers and administrators of Benton Harbor Area Schools, employees of Lakeland Health System, faculty and students from Andrews University and the Adler School of Professional Psychology, and staff of Southwest Michigan Meals on Wheels. In addition, several national food vendors, consultants, and an army of local volunteers were involved in the project. Among them were planning and public health professionals, nutritionists and registered dietitians, psychologists and psychiatrists, exercise scientists, chefs and cooks, and transportation and supply chain specialists. Together, they designed menus and recipes that were high in Omega-3 fatty acids and low in sugar, sodium, colorings, preservatives, and other additives; they procured equipment and food; and they organized food storage, meal preparation and the transport of breakfast and lunches for 20 children five days a week for an eight-week period. While they were united in the big picture – translating the clinic science into a community setting—their distinct, and sometimes conflicting, worldviews, social understandings, and agendas did pose challenges to the translation process. In addition, issues of race and class were salient in the project. These differences gave rise to and highlighted a challenge that affects most efforts to translate clinical research into real-world, community settings: conflicting and, at times, mutually-exclusive priorities. This challenge limits the capacity for science to be used to help solve many of the urgent social issues that plague contemporary society, such as community violence. This series will tell the story of the eight-week interventional study—with the players involved, logistics worked out, and lessons learned—with a focus on the challenges of and possible solutions to diverse agendas and priorities of collaborators. Post by Mari Pat Varga and Jill Stewart. Great post. What maps did you use? What sources did you use for the maps? The area I am working on has similar poverty rates so it would be interesting to compare the same maps (Binghamton, New York).